In February this year, as part of a large collaborative project, my colleagues and I published a paper in Nature Communications showing that heat alone can stimulate deterministic magnetization reversal in GdFeCo. This project was stimulated by the results of Stanciu et al. who showed that all-optical control of magnetization was possible using femtosecond laser pulses of different chiralities. The aim of this work was initially to use my model of GdFeCo to provide insight into the processes occurring on the femtosecond timescale with atomic resolution. As it turned out we discovered that, as part of a systematic study, the switching seen in GdFeCo was possible without using circularly polarized light. This means that all of the laser light is absorbed as heat and we showed, using our model, that it was this heat that was driving the reversal. Until this point, it was believed that heat could only assist in magnetization reversal by driving down the energy barrier associated with switching. In the paper we showed that using heat alone it was possible to induce reversal in micro-structures of GdFeCo experimentally. 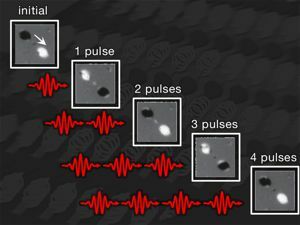 This was an important step forward in realizing this mechanism for applications as the switching had only previously been seen in large thin films. Though the micro-structures were nowhere near the size of confined magnetic structures seen inbit-pattern media, this was an important proof of principle of the concept of heat driven switching. Work is now underway to explain and provide insights into the mechanism behind the switching. The hope is that by being able to explain more thoroughly what is going on, we can find new materials that exhibit this behavior. 12th April - a joint theoretical and experimental study of the phase transition in FeRh has been published in Scientific Reports.